Whiplash – What’s Your Leadership Style? I apologize to all my readers for being off the radar for the last 20 days. I thought I could weed through recurring heart palpitations, but I had to drastically change my entire lifestyle, including diet, exercise, stress and a few other items. 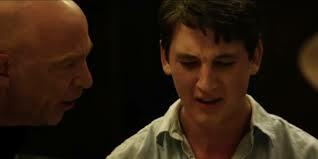 While off, I had an opportunity to watch Damien Sayre Chazelle’s second film Whiplash. Whiplash glorifies the grueling and bloody drive to become better, to push harder than body and soul should allow. There’s this inane recurring idea in both film and life that to reach the pinnacle of your career, one must be tortured by said career. According to Terence Fletcher, the sadistic jazz instructor, “Good Job” are the two most harmful words in the English language. If you’re not driven mad to perfection, then you’re some kind reprobate who’s comforted by a ‘good job’ mentality and never destined for glory. That life isn’t about how hard you can hit. It’s about how hard you can get hit and keep moving forward! That the next champion never gets discouraged! That you have to sacrifice in order to achieve success! I see this movie being used in business schools across America as a symbol for god-awful leadership. Yet many, whether budding artist or venture capitalist, willingly surrender each day to some sadistic teacher in the name of greatness. Just as Fletcher slaps his student (Andrew) in tempo, throws chairs and uses his student’s personal information to humiliate him, boardrooms across America regularly accept such a leadership style. Being successful in following our passion requires delivering more than what we could ever expect. And sometimes we need someone who defies our ability to focus and be resilient. The good news is that when you finally do it, it’s because you found your passion. “If you are believing for your child to find God, go help somebody else’s child to develop a relationship with God. If you’re struggling financially, go out and help somebody who has less than you have … f you want to reap financial blessings, you must sow financial seeds in the lives of others … If you want to see healing and restoration come to your life, go out and help somebody else get well” (pp. 224, 250-51). Everyone looks at such teachers and drop in awe. But for most of us, achieving one’s pinnacle shouldn’t be filled with exhaustion and desperation. Doing so makes one emotionally vulnerable. That’s what happens in Whiplash and in life. What of the millions who are searching, hoping and desperate? What of their search? We owe it to them to not tolerate such leaders. Negative attack ads and partisan speeches only create conflict. Being a leader involves stress, conflict, and more work that anyone can imagine. Meditating has been shown to have many health benefits, but more importantly it can help you center yourself after a long day and build up your mental calmness. Make the best use of your words ensuring you do not create false speech, abusive speech, or speech that creates division. Bring people together, not apart. Although a leader cannot make all these things go away in a modern world, they can help create the conditions to make them less desirable or needed. Being a ruler requires clear understanding: study the past and present, know when to be active and passive, temper force with mercy, be kind to one’s subordinates, benefit the people, and give equally.